Dogs have been at the heart of Country Life magazine ever since it was first published in 1897. The very first issue on January 8 featured the Princess of Wales with her borzoi, Alex. The second issue, a week later, went behind the scenes of the Prince of Wales’s kennels. Since then every type, from working dogs to pampered pets and champion pedigrees to mixed breeds have been included. There is no doubt that dogs, whatever shape or size, are at the heart of British country life. Posh Dogs features a selection of canines that have graced the pages of Country Life magazine from those early years to the present day. They have been chosen to select different facets of country life and whether ‘upstairs’ and ‘downstairs’ they are all equal in their owner’s eyes. 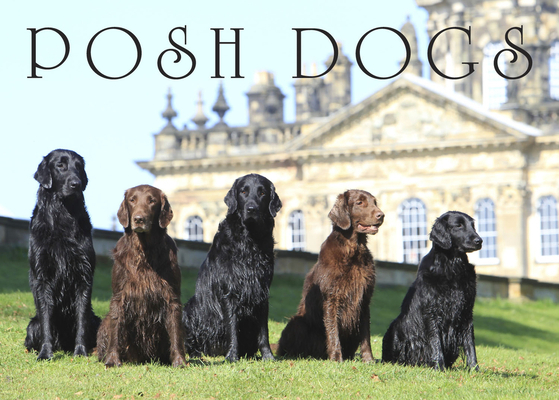 Posh Dogs celebrates dogs in their element amidst the timeless beauty of the British countryside. The dogs of Downton Abbey garnered as many fans as the cast. The dogs featured in Posh Dogs are the real life incarnations of the Earl of Grantham's beloved labrador and all the other dogs of Downton. This is a must-have gift book for all dog lovers. Pimpernel Press is an independent publisher of beautiful books on art, design, houses, gardens, and more, including stunning wrapping paper books, in association with Sir John Soane's Museum, the British Library, the Victoria & Albert Museum, the Natural History Museum, and Glasgow Museums.